Commercial Helicopters Ltd was formed by Keith and Robyn McKenzie in 1980 to take over James Aviation’s Taumarunui helicopter operation using Hughes 369D ZK-HNT (c/n 590514D). Keith was no stranger to helicopters having been the chief pilot for James Aviation’s helicopter division. Among other things the helicopter is regularly used by vulcanologists studying and testing the thermal and volcanic activity in the hot crater lake of Mt Ruapehu. Keith McKenzie’s flying search and rescue missions on Mt Ruapehu and in the Tongariro National Park and Whanganui National Parks led to him being awarded the QSM in 2001. Commercial Helicopters' Hughes 500D a long way from home at Greymouth on 26 August 1987. In 1987 the company diversified into fixed wing operations. They leased land to develop an airfield on Taurewa Station which is located near the Chateau on the western side of Mt Ruapehu. 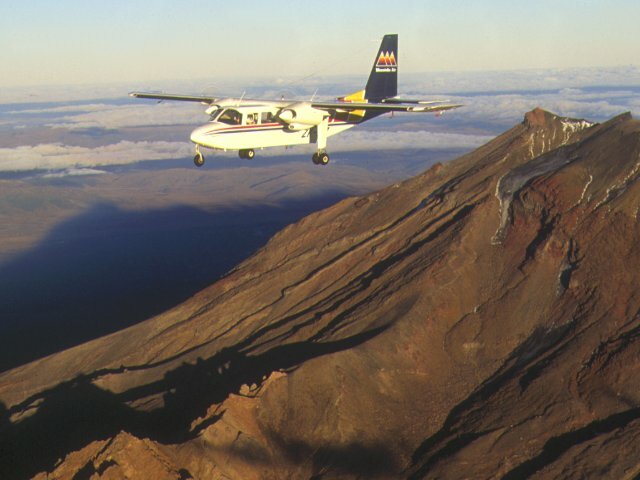 Initially scenic flights were offered over the Central North Island’s Volcanic Plateau using Cessna 172M Skyhawk ZK-EKP (c/n 17267279). Two years later, in 1989, Cessna 206 Super Skywagon ZK-DOV (c/n 206-0248) was also added to the fleet. No flying today!!! Above Cessna 206 ZK-DOV and below Cessna 172 ZK-EKP taken at the Chateau on 22 November 1996. In 1992 the company purchased its first twin-engined aircraft, Piper Pa23-250 Aztec E ZK-PIX (c/n 27-4738) which was followed by a second Piper Pa23-250 Aztec E, ZK-PIW, Pihanga (c/n 27--7305089), the following year. At the same time new bases were established, at Turangi in 1992 and at Flat Hills, near Mangaweka, in 1993. The two Piper Aztecs, above, ZK-PIW taken at Hamilton on 7 October 1998 and, below, ZK-PIX taken at Ardmore on 17 May 2008. Another fleet expansion followed a couple of years later with the addition of two nine-seat Britten-Norman Islanders. The first Britten-Norman BN2A-26 Islander, ZK-PIZ, Tongariro (c/n 2012), was registered to the company in December 1995 and a year later, in November 1996, Britten-Norman BN2A-20 Islander ZK-PIY (c/n 344) was added to the fleet. The purchase of the Islanders coincided with Mt Ruapehu erupting in 1995 and 1996. The airline was one of the few local businesses that benefitted from this, experiencing a doubling in passengers as people wanted to see the eruptions from the air. Britten Norman Islander ZK-PIZ, Tongariro, taken at the Chateau on 22 November 1996. On the 4th of April 1997 Mountain Air started a three day a week scheduled service between Auckland, Turangi and the Chateau enabling skiers easy access to the Volcanic Plateau skifields. These flights were again operated in the winters of 1998 and 1999 but in 2000 the flights were only operated an aircraft-charter basis. In 1998, however, another event in 1998 was to have a determining impact on the future of Mountain Air. In Hamilton for maintenance on 26 November 1996 was Britten Norman Islander ZK-PIY. In mid-June of that year the Civil Aviation Authority grounded Great Barrier Airlines. To maintain its services Great Barrier Airlines chartered aircraft from its competitor, Northern Air, and also two aircraft from Mountain Air. Following Great Barrier Airlines’ licence being restored Mountain Air decided to launch its own service to Great Barrier Island. In September 1988 the company established an Auckland base with three daily returns flights being operated to Great Barrier Island on the 1st of September 1998. Both the Piper Aztecs and Britten-Norman Islanders were used on the flights, according to demand. The service was branded as Great Barrier Xpress to give it a local flavour. To promote their service Mountain Air looked to ways to develop their relationship with Great Barrier Islanders. One way was to give residents something of the “delights” of Auckland including flying pre-paid Lotto tickets to Claris each Saturday and Kentucky Fried Chicken on Sundays. The airline's business manager, Bruce Rollinson, told the Barrier Bulletin, “It comes down to Mountain Air making a point of difference, that we go that little extra to provide a service. We want to build a strong relationship with our Barrier customers - hence our byline the friendly connection." As well as the Great Barrier flights the company also continued to develop charter work out of Auckland and in December 2000 they also launched a new air service from Auckland to Whangarei and Kaitaia trading as Air Kaitaia (see : http://3rdlevelnz.blogspot.com/2010/05/nzs-northern-most-airline-air-kaitaia.html). The service to the far north was not successful, however, and the flights to Kaitaia were cut in October 2003. The courier flights continued to Whangarei, however, and at the same time a Whangarei-Great Barrier Island link was established. The number of flights varied from 2 to 7 flights a week according to the season. Barrier Bulletin 15 July 2003, including the new Whangarei-Great Barrier Airline service. Following the arrival at Whangarei of the courier service from Auckland the aircraft would route back to Auckland via Great Barrier Island with the reverse being flown in the evening. For a short time Mountain Air helped out other operators as it had done for Great Barrier Airlines. In January 2005 it picked up Waiheke Air’s services and it January 2007 it did the same for Tauranga-based Island Air Charters following both companies being grounded by the Civil Aviation Authority. In 2001, with the Great Barrier service firmly established, the company purchased a new building to serve as their terminal at Claris. With the traffic on the Great Barrier Island service increasing Mountain Air added to its operation. Britten Norman BN2A-6 Islander ZK-SFK (c/n 236) joined the fleet in June 2005 and Britten-Norman BN2B-26 Islander ZK-DLA (c/n 2131) in May 2007. 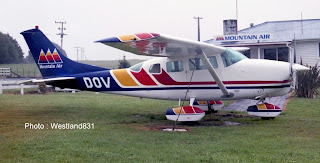 This last Islander never operated in Mountain Air colours. The two Piper Aztecs, ZK-PIX and ZK-PIW, were sold to Sunair in December 2008. 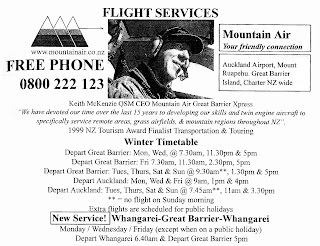 A few months after Mountain Air had started on the Auckland-Great Barrier Island route the third operator, Northern Air, pulled out. Competition between Mountain Air and Great Barrier Airlines was less than amicable. It finally came to a head other Mountain Air labelling their service as Great Barrier Xpress. 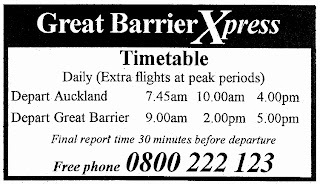 The Barrier Bulletin of 4 October 2006 carried a letter from a Great Barrier Island resident who noted the Great Barrier Airlines’ Trislanders were sporting the name Great Barrier Express? The correspondent wrote that he had checked with Great Barrier Airlines who tersely told him, "It’s our name." 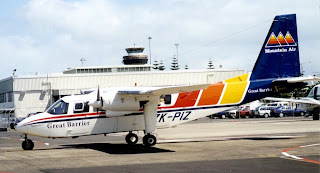 The controversial name - Great Barrier Xpress - on Piper Aztec ZK-PIX at Ardmore on 19 January 1999 and on BN Islander ZK-PIZ at Auckland on 11 October 1999. The following issue of the Barrier Bulletin had a letter from Great Barrier Airlines stating that they had purchased the trading name Great Barrier Express from Air National at some considerable cost and that Mountain Air had been using the Great Barrier Xpress name illegally. Mountain Air responded in the next issue. 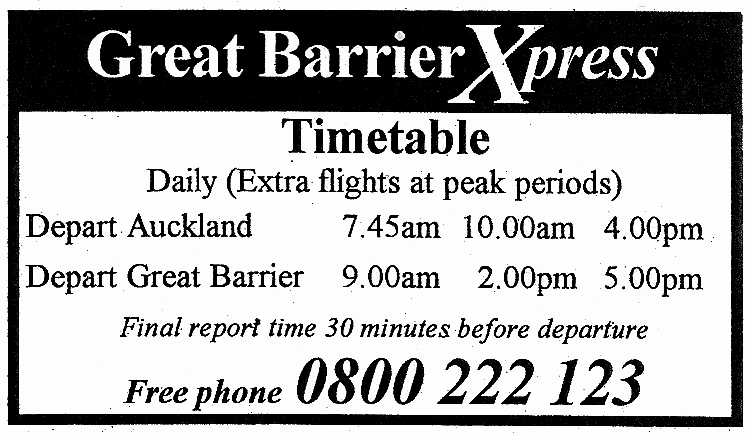 They claimed they had used the Great Barrier Xpress name since beginning Barrier service’s in September 1998. The name was in lights above their counter at Auckland Airport, which was next door to Great Barrier Airline’s. Great Barrier Airlines had made no comment on the name for more than two years when Gerard Rea, owner of Great Barrier Airlines, changed the name of a company he owned, The Twin Otter Company Ltd, to Great Barrier Xpress Airlines Limited in October 2000. Mountain Air suggested that Great Barrier Airlines started using both names to benefit from the Great Barrier Xpress brand recognition Mountain Air had established and the resulting customer confusion. The matter was further complicated when in June 2006 Keith McKenzie registered a new company, Great Barrier AIR Ltd. Great Barrier AIRLINES started legal proceedings after Great Barrier Air appeared in the yellow pages above its own entry. The first hearing, which was won by Mountain Air, was taken to appeal. In late December 2007 Justice Helen Winkelmann ruled that Great Barrier Air (Mountain Air) had to stop using the name Great Barrier Air in any advertising or promotional material until the court case was settled. Pending the outcome of the case Mountain Air's telephone lines were independently monitored to ensure that anyone seeking Great Barrier Airlines were directed to the correct business. In the end Great Barrier Airlines won out. Sporting its ex-Wings Over Whales colour scheme is Britten Norman Islander at Ardmore on 6 April 2008. Then, in June 2008, Mountain Air made the decision to rebrand Mountain Air/Great Barrier Xpress as Fly My Sky. This involved the Great Barrier Island operation and the Taumarunui-based helicopter operation. Meanwhile, the Chateau based fixed wing operation was sold to Bhrent and Kathy Guy in May 2007. This operation, which took both the Cessna 172 ZK-EKP and Cessna 206 ZK-DOV, continues to fly under the Mountain Air banner.